The Winter School enrolled 40 students from 19 countries working across disciplines. The recently concluded Winter School on Transnational Organised Crime held in Vienna between January 13th and 24th, 2019, invited scholars and practitioners from different disciplines to examine a range of cross-cutting issues relating to laws, theory and research methods on organised crime, cyber-enabled crime, corruption and terrorism. The ten-day programme was organised by the Standing Group on Organised Crime of the European Consortium for Political Research (ECPR) in collaboration with John Jay College of Criminal Justice (City University of New York), Center for Ubiquitous Computing (University of Oulu), and the United Nations Office on Drugs and Crime (UNODC). 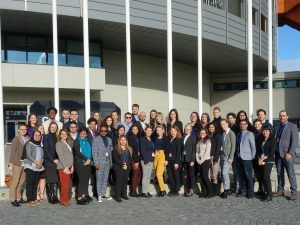 The participants also visited the International Organization of Migration (IOM), Organization for Security and Co-operation in Europe (OSCE) and the Austrian office of the Global Initiative against Transnational Organized Crime, among other organisations in Vienna. The welcoming address was delivered by Ms. Riikka Puttonen, team leader on legislative assistance and knowledge management on the Organized Crime Convention at the Organized Crime Branch of the United National Office for Drug and Crime.